Billy Taylor died December 28. The pianist is seen here 52 years ago with a group of musicians associated with Count Basie's band. Taylor sounds excellent, but it's impossible to outshine Mr. Five by Five, Vic, Vice Prez and Buck. I could watch this brilliant clip all day. *The Star published an overview of the year on Kansas City's jazz scene. It's a solid piece, but the author inadvertently overlooked a handful of noteworthy items. The Metheny brothers had a terrific year. Mike's adventurously eclectic 60.1 album is very good. Pat's Orchestrion project, which touched down at the Uptown Theater in May, challenged preconceived perceptions of the ways in which music may be performed. Also omitted were the deaths of prominent area jazz veterans Pete Eye and Oscar "Lucky" Wesley. And lest we forget, 2010 was also the year Curtis Got Slapped. *Steve Paul praises the contributions of the People's Liberation Big Band. *KCJazzLark makes another invaluable contribution to Kansas City's jazz scene with the unearthing of additional Jay McShann footage. *Ink asks Hermon Mehari to pick favorites. *Mark Lowrey blogs for the Midwest Music Foundation. *Pat Metheny's Orchestrion is ranked #50 in the Village Voice's jazz critic's poll. Dave Holland, who will be at the Gem Theater on January 22, is represented at #12 with Pathways. *Stephanie Laws has "a case of the Mondays". *Steve Penn notes the holiday efforts of the Coda Jazz Fund. *Here's the EPK for An Open Letter to Thelonious, Ellis Marsalis's new album. The pianist will perform at the Folly Theater on February 11. *From Jim Mair: The Kansas City High School All Star Jazz Ensemble will headline Tim Whitmer's series Spirituality and All That Jazz on Wednesday, January 5, at 7:00pm at Unity on the Plaza... The group is under the direction of Doug Talley. During the fascinating pre-concert discussion at the Folly Theater on September 25, a member of The Bad Plus defended his complicated relationship with jazz. He and his two band mates, he explained, had developed their passion for jazz in an entirely organic fashion. No one introduced them to the music. Instead, their innate curiosity led them to the genre. I came to jazz in much the same fashion. And like the men in The Bad Plus, I retain my love of popular music. I don't trust any musician under the age of forty that hasn't listened to Kanye West's new album. It's disingenuous for contemporary musicians to insulate themselves from the culture at large. I don't necessarily want jazz musicians to emulate West's music, but they at least owe it to themselves and their audiences to know the score. Crosscurrent, a Lennie Tristano-inspired band, perform at Jardine's tonight. Its music is excellent. Because a few of the band's members bear a faint resemblance to these caricatures, the band- at least in their current form- are unlikely to find a big audience. Crosscurrent's insistence on purity, while admirable, is confining. I'll always prefer the guys who come from a background and mindset more akin to my own. A prominent Kansas City-based jazz musician, for instance, was a member of '90s rock band Grumpy. It wasn't a great band, but the musician's music today is undoubtedly richer for that experience. "And I'd like to say that Charlie Parker was my idol... And I'm saying that to say I'm just glad that I'm able to be able to be here with the wonderful ensemble to play some of the things that Charlie Parker did. Never the way he did- but at least attempt, you see. I'm 74 years old I've got another 74 to try it." -The late James Moody's introduction to the embedded 1999 performance of "Parker's Mood." *A free download of the Black House Improvisors' Collective's December 10 performance (image above) is available here. *A new Interstring recording is noted by Joe Klopus. *KCJazzLark endorses five albums by Kansas City jazz artists. *Steve Penn provides a recap of the trip Bobby Watson and his UMKC students took to Japan. *Robert Folsom reviewed Kenny G's concert at the Midland Theater. *Tony's Kansas City shares Plastic Sax's enthusiasm for Mark Lowrey. *Lee Ingalls, a long-time advocate of Kansas City's jazz scene, sang "Fly Me To the Moon" last week. *A self-appointed know-it-all wants the Kauffman Center to book Keith Jarrett and instead of Willie Nelson. *Lee Hill Kavanaugh wrote a warm remembrance of Steve Herold. A couple years ago a Plastic Sax reader suggested that I reveal my personal musical preferences. I demurred. Keeping my tastes to myself seemed appropriate at the time. As this site has become more prominent, however, whatever veil of anonymity once existed has been shredded. Here are my favorite jazz albums and jazz performances of 2010. One of the best-kept secrets on the Kansas City jazz scene regularly occurs Tuesdays at Harling's. Clint Ashlock leads young musicians in a traditional big band setting. While the venue's men's room leaves something to be desired, there's no cover and drinks are cheap. Ashlock recently posted the following note about his December 21 gig: Next Tuesday, join New Jazz Order big band at Harlings from 9-12. Great special guests, some Ellington Nutcracker and other irreverency. *KCJazzLark announced that he's been hired as Orchestra Manager of the Kansas City Jazz Orchestra. In a subsequent post, he appreciates the People's Liberation Big Band. *Miguel DeLeon was interviewed by Susan B. Wilson of KCUR. *KC Metropolis offers a review of Sachal Vasandani's concert at the Folly Theater. *Chris Burnett lists his top albums of 2010. *Tony's Kansas City recommends Dave Stephens' Christmas album. *Fundraising efforts for next year's Prairie Village Jazz Festival have begun. *Streetside Records in Westport is closing in January. *Tweet o' the Week: JazzWinterlude: Welcome to Johnson County Community College's Jazz Winterlude Twitter feed. We'll be sharing fun facts about the musicians playing there. *From Jeff Davis: Sir Threadius Mongus returns to Jardine's for 1-01-11, featuring a new lineup for the new year, Jeff Davis, Matt Otto, Andrew McGhie, Steve Lambert, Russell Thorpe, Bryan Hicks and Pat Adams... Andrew McGhie Quintet featuring Harold O'Neal, Hermon Mehari, Dominque Sanders and Ryan Lee start the night off at 7:30 p.m. While I futilely fret about the diminishing audience for jazz, Mark Lowrey is actively addressing the problem. His ongoing "musical evangelism" represents Kansas City's best hope for cultivating new jazz listeners. Lowrey didn't know that he was going to be named Plastic Sax's Person of the Year when he recently participated in the following email interview. Plastic Sax: I suspect that you are Kansas City's most active working musician. Is that true? Mark Lowrey: I can't say for sure. I love to play, and the instrument that chose me lends itself to playing in a wide variety of styles and as a solo artist. PS: Which of your many gigs gives you the most satisfaction? ML: Very difficult question- as you know, I have diverse interests. Playing straight-ahead jazz gives me very different emotional connections than, say, tango or folk/pop, etc. I guess I would have to say that the best I feel is in any group where I can be proud of a performance and at the same time it is apparent that the audience has been moved in some way. PS: Are you able to make a living as a musician? ML: Yes. I supplement my performance income with a very part-time position at Hallmark. My title is "Creative on-call multimedia sound composer." Among other things, I get to write music that goes in stuffed animals. I love it, but it's only once in a while. PS: How much time do you spend conceptualizing, practicing and rehearsing special projects like the "Black Friday" show? ML: Every show is different, but for things like Black Friday, the Radiohead Tribute, etc., let's just say that I'd rather not calculate the income next to the hours spent. PS: A lot of the things you do probably aren't cost-effective. How do financial considerations effect your art? Have you ever declined to pursue an idea because it looked like a money-loser? ML: I look at bigger "one-off" shows in two ways that validate them. A) If we (musicians) were really in this for the money, there would be something fundamentally wrong with our brains. This stuff is FUN! I suppose I could just play in jazz clubs and play "All of Me" every night and never need to rehearse, practice, or hustle the media for coverage. It would be enough to pay the bills, but I get bored. I'm not saying that I don't like straight-ahead jazz- Red Garland is in my CD player right now. B) Some of these less financially sustaining shows in the short term I believe are doing good things for me in the long term. I think it's important to appreciate the money gigs for the fact that they feed you. However, the gigs you do for the love of music and the desire to share this love with other people can feed you in a much different way. PS: Do the regular misspellings of your name bother you? ML: Ha! It happens so often that I don't freak out about it. One thing that bothers me (and it happens more than you'd think) is when I have to correct a journalist, club owner, or promoter more than one time. PS: You've seen several of your collaborators leave Kansas City for bigger scenes like New York. Are you ever tempted to test the waters elsewhere? ML: Yes, but I haven't tapped this town out yet. There are so many great musicians here still and the scene is on a rise. Plus, with the low cost of living and my established relationships here in KC, it's easier to put new projects together with good hope for success. PS: Which Kansas City musicians do you most respect? ML: So many - not the full list - here's what I can come up with in 60 seconds in no particular order. Hermon Mehari, Doug Auwarter, Roger Wilder, Shay Estes, Les Izmore, Brandon Draper, Lonnie McFadden, Donovan Bailey, Barclay Martin, Wayne Hawkins, Matt Otto. This list could be really long. PS: What did you hope to accomplish with your new solo piano album? Are you pleased with the result? ML: I wanted it to sound like me, which I guess is all one can hope for. It sounds like me on a good day. So I accomplished what I set out to. Albeit I have a long way to go, and a solo recording has a profound humbling effect on me. My friends and colleagues have helped me to minimize the over-self-criticism. PS: What are the best and worst aspects of Kansas City's music scene? How could it be improved? ML: Creativity abounds and barriers are being broken down. We still need KC citizens to "own" the fact that we are a jazz town. We need KC to take pride in and support live music. We need you. PS: Are projects like the Radiohead tributes, the jazz/hip hop collaborations and your work in the Barclay Martin Ensemble a deliberate attempt to bring new fans to jazz, or do you even worry about that sort of thing? ML: That is close to exactly why I do many of these things. Hermon and I call it "Musical Evangelism." PS: Do you anticipate that traditional/straight-ahead/mainstream jazz will be played in Kansas City clubs twenty years from now? ML: I hope so, and I hope that the more conservative musicians/audiences understand that I have a profound love for traditional jazz. I just think there's room for both schools of thought. PS: It seems like 2010 has been a huge year for you. Can you name a couple favorite moments? What can your fans look forward to in 2011? ML: Thanks, Bill. 2010 has been SO fun! I liked when we did our first Mark Lowrey vs. Hip Hop show in January. I looked out into the packed-like-sardines crowd at Czar Bar on a night that it was ten below zero and noticed that it was the most ethnically and culturally diverse crowd I had ever played for. Everyone seemed to be having a good time and there were no hang-ups. That is unfortunately not as common as I'd like to see in Kansas City. Another was playing at the Folly Theater for Barclay Martin Ensemble's release of Pools That Swell With The Rain. It is an album I am proud to play on, and the Folly theater felt a little symbolic of some kind of success to me. 2011? I am sure about doing more with local emcees. I'll book more Mark Lowrey with Drums gigs in rock venues, and, ok , I'll say it: the next tribute concert will be Paul Simon. Joe Klopus raves about Sachal Vasandani in his preview of the silky vocalist's December 10 Kansas City debut at the Folly Theater. I concur with his positive assessment. *What a treasure! Check out this recently uploaded sidewalk interview with Eddie Saunders from 2004. *Steve Penn checks in with Chris Burnett. He also provides an update on the Black Archives of Mid-America. *More essential history about Kansas City's jazz scene is provided by KCJazzLark. *Wonderful footage of a duet with Jay McShann comes near the conclusion of the new documentary Dave Brubeck: In His Own Sweet Way. *Ink reviewed Mark Lowrey's new Live at Jardine's album. *The Peachtree Restaurant in the Power & Light district has closed. *The majority of the 13 comments at the previous Plastic Sax post are compelling. *Here's the flyer for the Friday performance by the Black House Improvisors' Collective. *From Bob Asher: Top of the Bottoms Social Aid - Pleasure Club - Benevolent Society will be hosting our 11th annual Masquerade Ball on Saturday, February 26 at Crosstown Station... This year, we will feature two floors of entertainment including Hearts of Darkness and Pope of Dope on the main floor and Snuff Jazz and DJ Fat Sal in the upstairs "Krewe Lounge". Saturday afternoon at the Blue Room was a great hang. 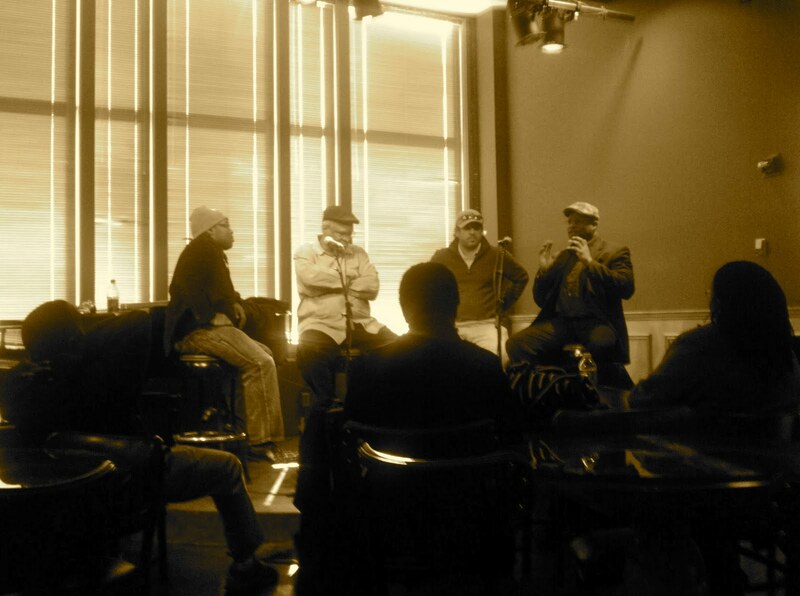 Joey Calderazzo, Gerald Dunn, Bobby Watson and Dennis Winslett were on hand to ponder "Jazz and the Music Industry." Their freewheeling discussion included trash talk, salacious gossip and a handful of genuine insights. It was hip, entertaining and over two hours behind schedule. The latter component might partially explain why less than a dozen people, including American Jazz Museum staff members and spouses of panelists, attended. An anonymous commenter at the previous Plastic Sax post characterized Calderazzo as a "bitter a******." The talented pianist may be jaded, but I appreciated his candor. And like his three fellow panelists, he's really smart. Even so, I disagreed with much of what I heard. Two video cameras were rolling and the four men had to have seen me taking notes. I'm not comfortable, however, quoting anyone directly. Instead, I'll broadly generalize the primary topics of the discussion and toss in my two cents. The bad economy is responsible for poor attendance at jazz clubs. I'm so tired of hearing this lame excuse. Times are undoubtedly tough, but Saturday's free event featured two internationally-acclaimed musicians and attracted less than twelve people. The previous night I was a member of a capacity audience of 2,000 at the Midland Theater. The cheapest tickets for the rock show were $45. The next day I was among a crowd of almost 1,000 people who paid $17 each to hear Kansas City jazz artists play Christmas carols. People still spend lots of money to hear the musicians that excite them. Hip hop is horrible and fusions of jazz and hip hop are whack. If you say so, Grampa. Kenny G is a hack. Whatever. I'd rather listen to Kenny G than hear people bash him for the hundredth time. Club owners and jazz promoters are often unpleasant and unethical. Money is more important than art to music industry executives. Case in point: Grammy Award nominations don't always go to the best artists. An audience member fretted that jazz is becoming "blond-haired and blue eyed." She asked how this trend could be reversed. None of us have any easy answers. Jazz musicians are smarter than everybody else. Bitter and better are two different things. The youth of today are insolent, poorly-educated louts. Preferring Young Jeezy over Sonny Rollins doesn't make someone a bad person. Someone asked what "the blueprint" for a young jazz artist should look like. I guess she didn't realize that this guy was in the room. Six degrees of Kevin Bacon has nothing on the jazz world. One of the joys provided by jazz is the constant shuffling of musicians. Take this clip. Joey Calderazzo appeared at the Gem Theater with Branford Marsalis last month. He's seen here with Dave Holland. The bassist will lead a band at the Gem Theater next month. Drummer Jack DeJohnette and the late saxophonist Michael Brecker seemingly played with everyone. Also in the band but absent in this brief clip is a guy named Pat Metheny. Joe Klopus previewed Calderazzo's gig Saturday at the Blue Room. Calderazzo will also participate in a master class and discussion earlier in the day. See the previous Plastic Sax post for details. *A.G. Sulzberger of The New York Times chats with Rod Fleeman, Dave Stephens and Gerald Spaits about the indignities associated with performing Christmas music. *KCJazzLark praises Alaturka. His photos, as usual, are outstanding. *According to a source in this article, Clint Eastwood considered shooting Bird on location in Kansas City. *Here's a review of Killer Strayhorn's latest album. *Tweet o' the week: SwingSalsaTango: Tonight! Salsa is at the Grand Emporium on Main downtown KCMO. Its the Salsa Family Reunion everyone will be there! *From the American Jazz Museum: Acclaimed jazz pianist Joey Calderazzo will conduct a master class followed by a session entitled Jazz and the Modern Music Industry. Panelists will include Mr. Calderazzo, Bobby Watson, Director of Jazz Studies, UMKC & Gerald Dunn, Manager & Entertainment Director, the Blue Room. 11:00 a.m.-2:00 p.m. in the Blue Room. Session will be moderated by AJM Director of Education Dennis Winslett.